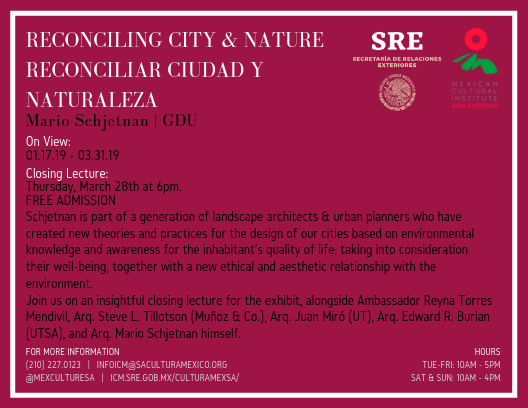 On Thursday, March 28, partner Juan Miró will be appearing at the Mexican Cultural Institute San Antonio as part of a series of lectures to mark the close of their current exhibit “Reconciling City & Nature”. The exhibit explores the work of architect Mario Schjetnan, who is part of a generation of landscape architects and urban planners who have created new theories and practices for the design of cities based on environmental knowledge and awareness for the inhabitants’ quality of life. Juan’s lecture, entitled “Building in Nature | Building with Nature” will focus on the emphasis that MRA places on creating spaces and places that forge a strong connection with the landscape. Juan will join fellow architects Steve Tillotson, Edward Burien, and Mario Schjetnan in a panel discussion with Mexican Ambassador Reyna Torres Mendivil. The Mexican Cultural Institute in San Antonio is part of the Ministry of Foreign Affairs' network of official institutions coordinated by Embassies and Consulates to spread, highlight and nurture the art and culture of Mexico abroad. The institute’s mission is to promote the knowledge of the cultural heritage of Mexico, to illustrate contemporary Mexican creative vitality, and to celebrate Mexican traditions.